Corns and calluses develop when skin is irritated by friction and rubbing. 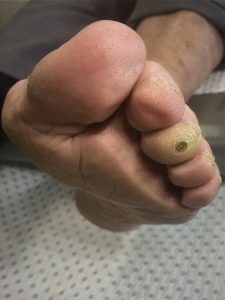 These lesions usually develop under the foot, on top of the toe joints, at the ends of or between the toes. Corns and calluses can cause excruciating pain and effect a patient’s ability to walk comfortably. Corns and calluses are treated by removal of the lesions. The use of moisturising creams and various forms of padding, orthotics and shoe modifications may be required to improve comfort and reduce the likelihood of the corn or callus happening again.